Its been too long without a post, but there is a reason to it. When returning from Spacefest V, I thought that might have been my Spacefix for the Summer. Shortly after our return a discussion among Spacetweeps started which soon we found could not pass without our coverage. 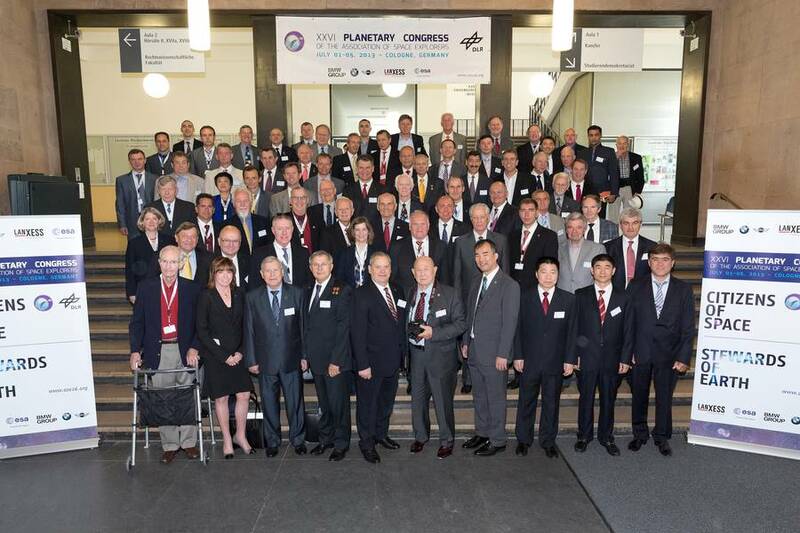 ASE26 or “The XXVI Planetary Congress of the Association of Space Explorers” was about to happen during the first week of July in the Metropolitan area of Cologne and 89 Astronauts, Cosmonauts and even Thaiconauts have announced their appearance! So what is the Association of Space Explorers? If interested, go to their website: http://www.spaceexplorers.org, but in short: It’s the association of all spaceflyers and their goal is discuss and inspire everything and everyone around Space and STEM (Science, Technology, Engineering and Math). In that we have a very common goal. Easy, if you have completed a full orbit around earth, you are qualified to join. Don’t make the cut? Well, me neither. So we had to come up with a different idea: Press-Coverage. Being “embedded Spacetweeps” covering Twitter / Facebook and other Socialmedia for other events already, it wasn’t too hard to talk the responsible persons into it (most of them at least). The program promised amazing stuff and so I had to free up my working schedule and get things done after hours and on weekends. 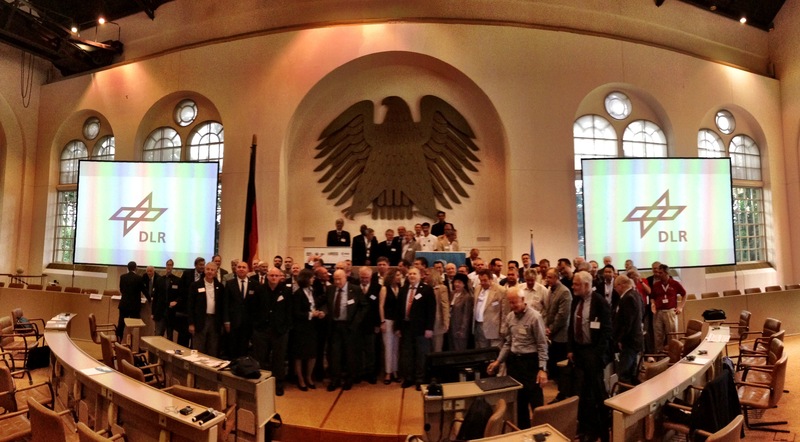 Opening of the Congress at the University Cologne. Surreal to stand beside the red carped and watch Cosmonaut icons like Aleksey Leonov (First man to leave a spacecraft), Rusty Schweickart (Apollo 9), Akihiko Hoshide (I saw him launch on STS-124), Kevin Ford (second-last ISS Commander) and Scott Kelly (Will be on ISS for one year in 2014/2015) + many many more pass by. I met Christer Fuglesang and Paolo Nespoli who both were nice enough to take part in the very first SpaceUp Europe of which I was lucky enough to be a co-organizer and co-host (different story). Its amazing when you get recognized and greeted among a crowd. After various welcoming speeches, Domitru-Dorin Prunariu, the head of the association gave the cristal helmet award to Prof. Riesenhuber, former German Minister for Research and Technology – and may I add – a talented and inspirational speaker. Both, Prunariu and Riesenhuber where the highlight of the day! Hopefully those speeches turn up on YouTube and if it does, I will add it here. Right after the opening, we went straight to the Press-Conference, where Reinhold Ewald confirmed a rumor that we all discussed for some time now. 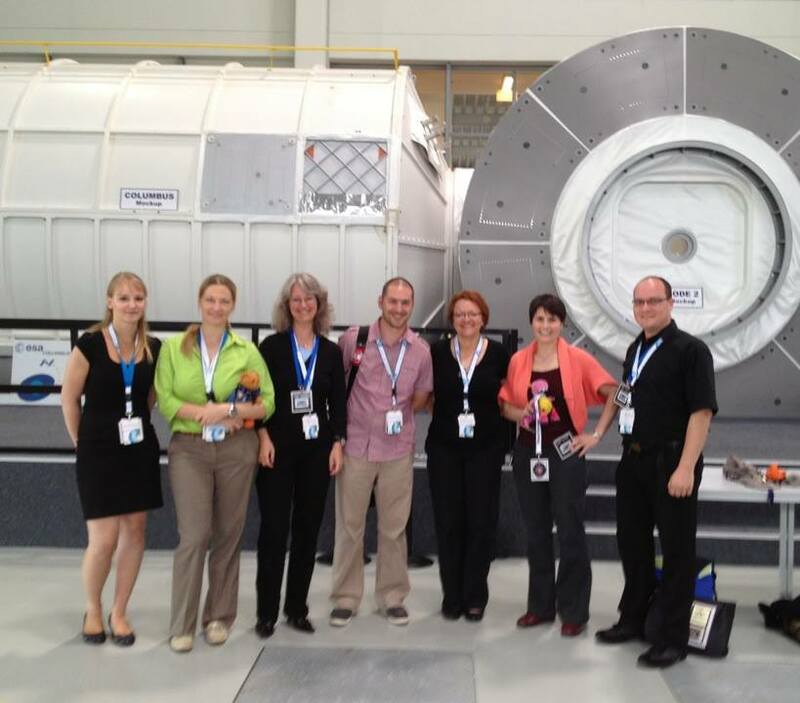 Save the date: September 22nd will be a DLR/ESA Spacetweetup at the German Aerospace Day in Cologne! (The site still shows the last event, but will certainly be updated shortly). The afternoon was passing quickly with interesting public presentations from Space Law to utilizations of ISS of which Airbourne Astronomy was my highlight, as Prof. Juergen Stutzki talked about SOFIA a joint venture between DLR and NASA. A thing that was very evident at the panel discussion, was that no-one wants to de-orbit ISS in 2020. Kevin Ford, who just returned from the orbital outpost in March, said “She is in good shape”. I hope the mission planners and accountants see the value they have in the flying observatory and consider using it much longer! With this, the Astronauts / Cosmonauts and Thaiconauts – or as we call them now in short “Snauts” – were loaded in their busses and had dinner among themselves. Time for the Spacetweeps to try and grasp the day by a cool “Kölsch”. 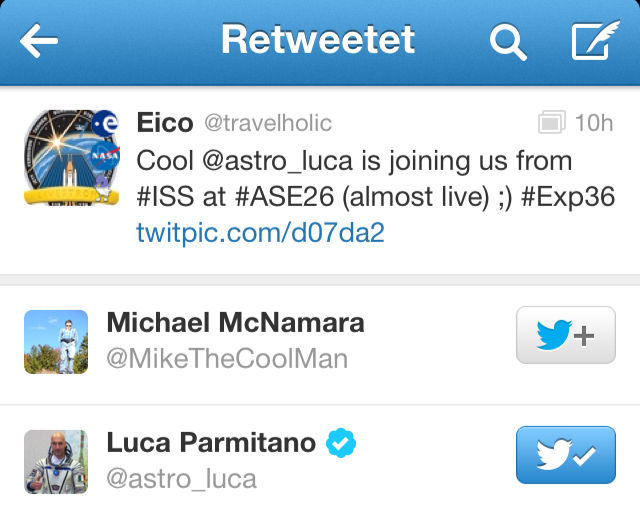 My day closed then with a retweet from Space. Stellar! Well, Tuesday was the only day, I couldn’t shift my appointments as I was hosting a long planned business meeting. But I knew the other tweeps were covering the day and will surely let me know all the amazing stuff I missed – which happened to be a lot of interaction with the Astros. Wednesday was community day for the ASE Members and so they swarmed out to 48 different Schools and Universities and Organizations. Alex and I choose this as the event to be for today. Domitru-Dorin Prunariu, Romanian Cosmonaut and head of the Association. Prunariu talked about the outreach activities and the Scholarship his association gives to students around the world in co-operation with various universities. Also some of the history of the association and how hard it has been at the beginning to unite all space-flyers. Obviously the governments of the Sowiet Union and America weren’t to keen on seeing the Astronauts exchange their views and experiences – but luckily this is a thing of the past. He described catching Salyut with parking into a garage, where someone constantly moves the garage around. And for the best talk of the day, Mario Runco spiced his presentations with a lot of Star Trek references. If you ever meet him, ask him about the time difference Enterprise-A and Enterprise-D will have when travelling to Alpha Centauri. Funny. 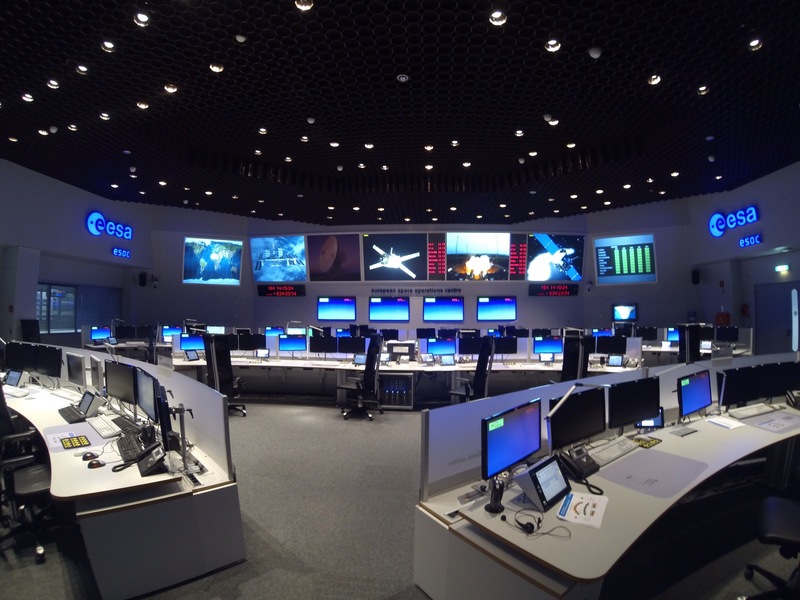 United Nations Office for Outer Space Affairs (UNOOSA) and United Nations Platform for Space-based Information for Disaster Management and Emergency Response (UN-SPIDER) in Bonn were hosting todays session of ASE26. Since we know two fabulous persons there, Chahira and Peter invited us to come here early and gave us a tour of UN-SPIDER. Let me say, the office is remarkable – what a view and what an display of satellites. Shortly after we had gotten our press-passes for the day, we sat down in the old plenary room of the Bundestag. This day was probably the most interesting one, as it was kind of an internal discussion among the Astronauts. The official theme was sustainability and environment protection. But one of the main discussions was around the need to get experiments to ISS quicker and without less “red-tape” if you will. Maybe there is something brewing, as the association made a call to their members to use their influence in this topic and further reflection will be done by its board. Besides that, we got a presentation about the need of international co-operation and if you happen to know me, this is a topic I am really passionate about. Nothing will be possible in the future, if we do not manage to pull our stuff together. Today was the opening of :envihab. A new medical science center for studies of Astronauts on Space flight as well as basic research in the understanding of the human body. 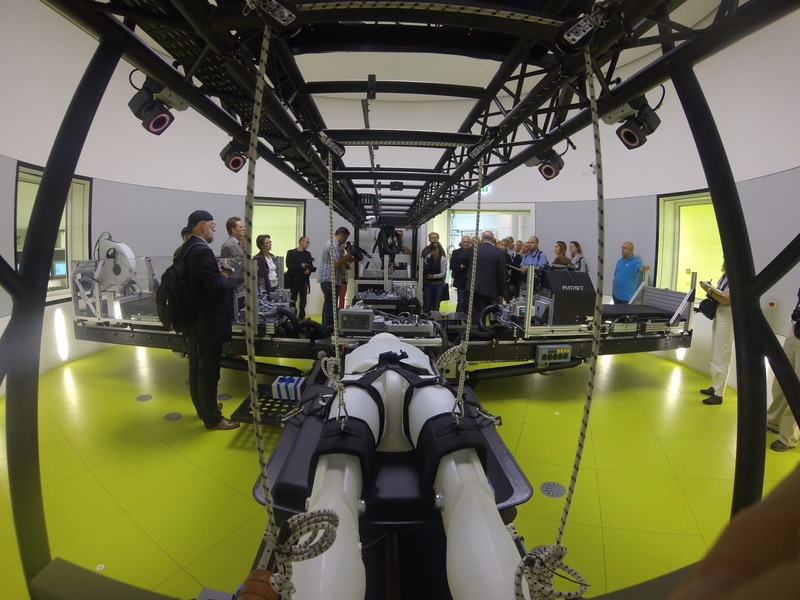 A state of the art building at the DLR site in Köln-Porz, :envihab hostes the newest in shortarm centrifuge technology, where doctors can directly examine the hart of a patient while he is subject to up to 11G! But not only this, but a new laboratory to conduct sleep research is hosted here. The not yet installed light ceiling will be able to produce any light temperature, the researchers want to see and research its impact on the “Pillownauts”. By the way, if you want to read from a real Pillownaut, I suggest the blog of my good friend Heather. Have you ever spend a thought about how noisy it might be up on ISS? No? Me neither. But thinking about it, this is a flying laboratory stuffed with experiments, coolers and other technical equipment. So if the ventilator of your PC during your 8h at work drive you mad, consider the magnitude up on ISS at a 24/7 exposure! This also is a research field of :envihab’s sleep lab. 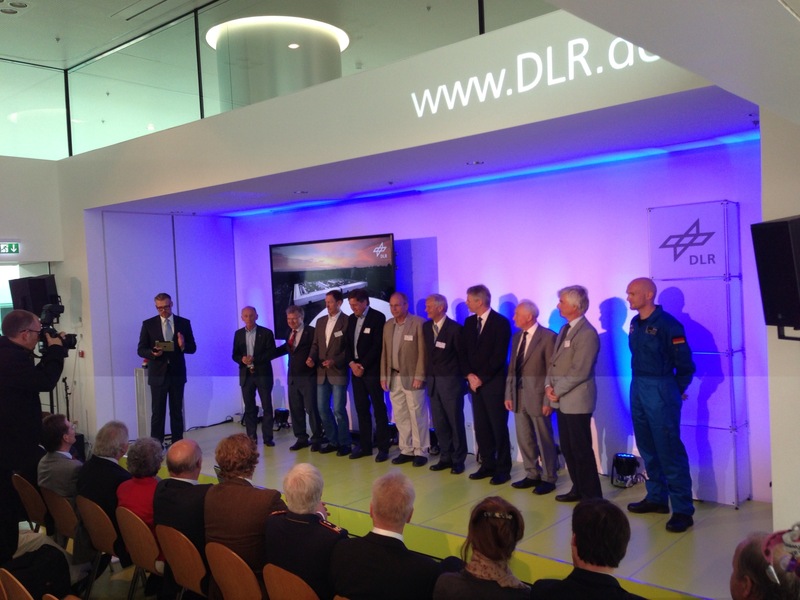 During the ceremonial opening, we were able to vitness a very rare occasion: All 10 living German Astronauts who have been or in the case of Alexander Gerst will be soon into Space were on stage for the very first time since 1990 (also without Alexander Gerst back then). After that I finally got to talk to him – those of you that were reading my last entry know that I missed him in Houston just a couple of weeks ago. 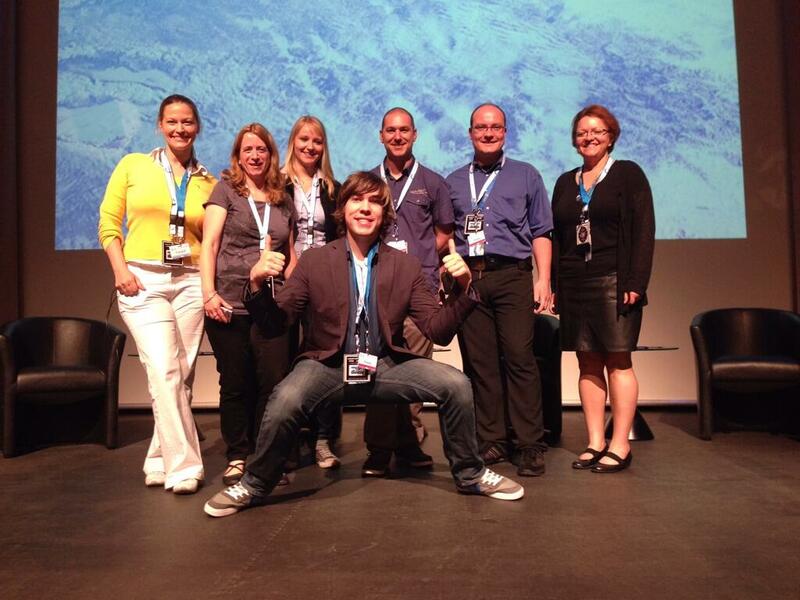 Very happy from the stuff that happend during this week, but exhausted, the saddest part of all Spacetweetups had come. We all had to part and say goodbye. But in our minds, it is already close to September and most of us will certainly see each other again for German Aerospace Day (TdLR) or maybe even Spacetweetup II. #SpaceUnites! (Sorry Jo for overusing this, but you made the most valid point).